The Phoenix Islands "Greatest Hits" highlights continue with this guest post by Stuart Sandin. Although corals and some algae form the backbone of a coral reef, it is the fish that give reefs their personality (at least from the perspective of a 'fish guy'). Notice, for example, that movie writers and animators did not have us finding Porites corals, but instead we focused on the reef fish Nemo and his friend Dori. Without fish, a reef would be essentially static, with limited color and even more limited movement. We fish guys make a living out of looking for fish, counting how many are around, and trying to figure out what they do. This all begins with advice from Dr. Seuss, "One fish, two fish, red fish, blue fish." During our time in the Phoenix Islands, Les, Tuake, and I tried to gain some ecological perspective regarding the fish from each of the islands. In set areas, we counted every fish swimming around, identifying the species and estimating each fish's size. From this we can estimate some fundamental properties of the fish assemblage -- how many fish are around, how much do they all weigh (which is important because fish vary dramatically in size), and what are the ecological roles that these animals are filling? Now what did we find? Well, we were able to confirm the long-pondered concept -- if you don't fish in an area, you get more fish. 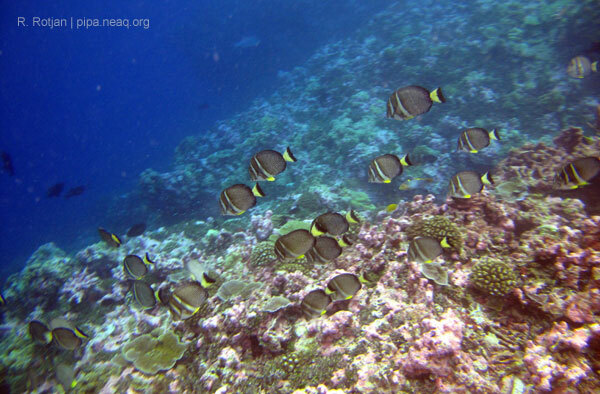 The reefs of the Phoenix Islands have no fishing activity, so it is not surprising that we find more fish there than in more heavily fished areas like Fiji, Hawaii, or any other inhabited island. 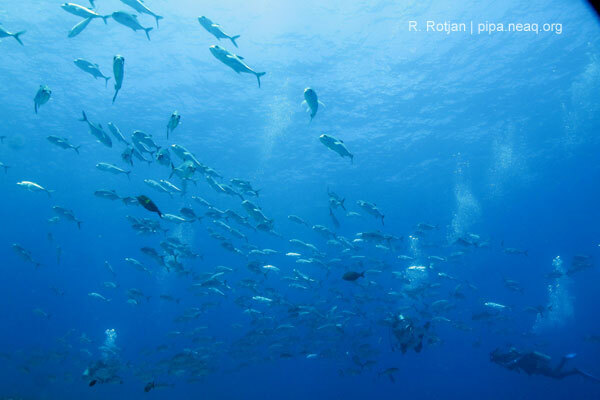 But what is surprising is the sheer bounty of fish that were present on the reefs. It seems that during every dive we would come across a large school of some species; sometimes we saw dozens of giant trevally, or hundreds of parrotfish, or thousands of convict surgeonfish. Add up all of these fish and you have a particularly large assemblage of animal mass. The best insights into this is perhaps completed by comparing the fish assemblages from the Phoenix islands to more commonly visited areas. Let's use the metric of total fish biomass (in other words, imagine that you took every fish out of a section of reef and weighed them...this is our metric of choice when summarizing multi-specific fish assemblages). Our surveys of the Phoenix islands revealed that there were about 250 grams per meter squared of reef, or about a half pound of fish in the area of the hood of a car. In contrast, the reefs of the main Hawaiian islands, Fiji, and Jamaica have about 65, 30, and 20 grams per meter squared, respectively. The reefs that most people visit during vacation are a shadow of their historic potential. But the reef fish of the Phoenix islands were not wholly pristine and devoid of the scars of human activities. On a number of the islands we did not see many reef sharks, and when we did find them the animals were small and young. Although fishing is currently outlawed from all reefs within PIPA, this has only been true for the past few years. Within the past 10 years there has been some fishing activity on the reefs, particularly targeting the sharks for their fins. Catering to a lucrative market for shark fins (used in shark fin soup), foreign fishing vessels find it to be profitable to legally (and sometimes illegally) to visit even the most remote reef areas to harvest sharks. 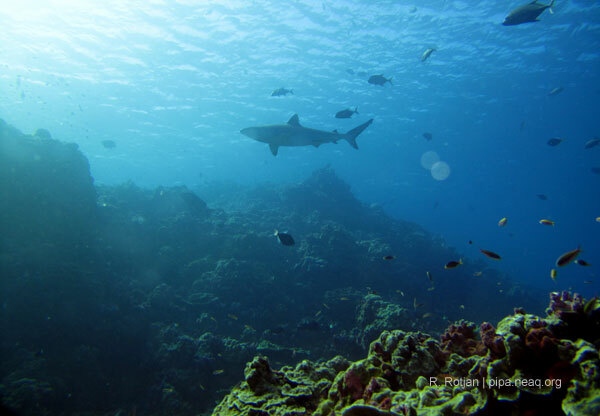 The regulations of PIPA prohibit any future shark finning from the reefs of the Phoenix islands, and the good number of juvenile reef sharks that we saw during this trip suggests that a recovery of shark populations is possible. But in order to realize this regrowth of shark populations, we have to assure compliance with the regulations. Multi-national efforts to improve surveillance of the remote and protected areas of the Pacific (under the jurisdictions of Kiribati as well as French Polynesia, the United States, and other nations) are beginning and will be essential to protect the splendor of these last remaining gems in sea. The theme of 'Phoenix rising' has been common during this trip -- we saw evidence of the corals recovering from a massive bleaching event, we saw bird populations soaring following removal of introduced rats, and we also see evidence that even the insulted shark populations can recover to full glory. I am proud to have been a part of such a proactive team of conservationists, politicians, and scientists focused on protecting the Phoenix islands. Only due to this type of effort can I hope that we will protect, and perhaps even improve, vast regions of the ocean for our children and their children to marvel at into the future.